2400 calories, 12 doughnuts, 5 miles, 1 hour. That was the challenge. When you live with a runner, it's only a matter of time before you become a runner. 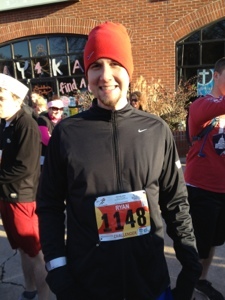 Ryan jumped on the bandwagon last fall and finished his first race this weekend! Yay! Go Hubby!! This race didn't only involve running, but eating as well. The Krispy Kreme challenge is an annual event held in Raleigh that challenges not only your physical ability, but your stomach strength as well. 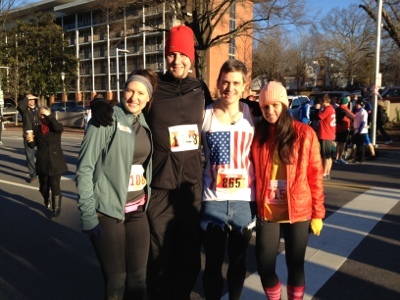 Probably the worst idea for a race, but it started with a few NC State students on a dare. The race is now one of the largest charity races in North Carolina (not to mention a great shout out for Krispy Kreme). Two of our closest friends drove up to run in the race with us. Jordan decided to partake in the dozen doughnut consuming aspect of the race, but Nancy and I were smart, we just ran and watched everyone be miserable! Since Nancy and I stick to a gluten-free diet, it was only fair that we get doughnuts too! So I made these chocolate gluten free doughnuts for us to enjoy! I know, most people hear gluten free and run, but honestly these were amazing! Since this was my first time making doughnuts (thanks for the baking dish bro), I did a little research to get started. I found inspiration at Running To The Kitchen, another fantastic healthy food blog that provides a lot of raw, gluten free and Paleo recipes. I started with a recipe for Chocolate Baked Donuts and went from there. These were a great guiltless treat after the race. Here's to having your doughnuts and eating them too! Preheat the oven to 350F and lightly grease a donut pan. In a large bowl, combine the almond flour, cacao, baking soda, espresso powder and salt. In two smaller bowls, separate the eggs putting the whites in a slightly larger bowl. Set the whites aside and add the melted coconut oil, honey and vanilla to the egg yolks. Whisk to combine and add to the dry ingredients bowl, stir to combine. Beat the egg whites with a hand held mixer until light and fluffy. Fold the egg whites into the batter until just combined. Pour the batter into a large Zip-loc bag or piping bag and squeeze the batter into the donut pan, about 2/3 full. Bake for 10-12 minutes, remove from the pan and cool before eating.